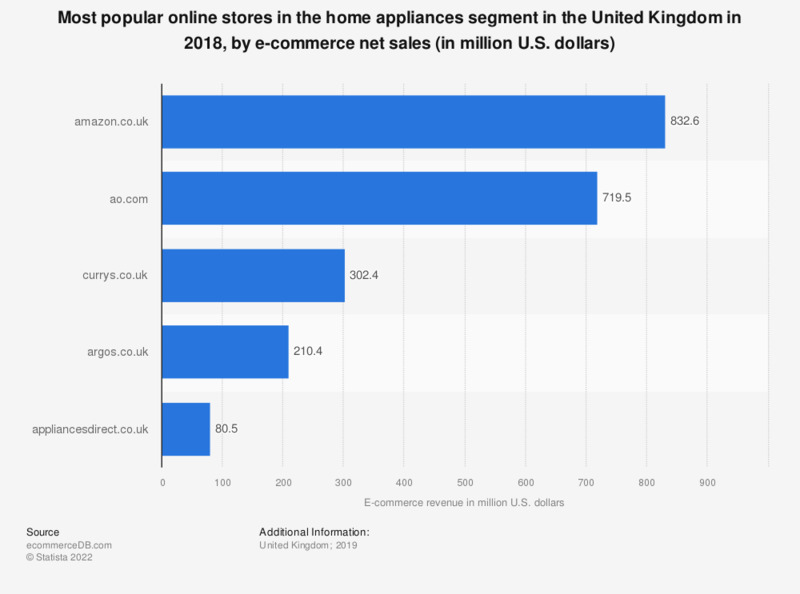 This statistic presents a ranking of the most popular online stores in the United Kingdom in the home appliances segment in 2018, sorted by annual net e-commerce sales. In 2018, market leader ao.com generated 719,5 million U.S. dollars via the sale of home appliances in the United Kingdom. The online store amazon.co.uk was ranked second with a revenue of 655,5 million U.S. dollars. The e-commerce market category “Home Appliances” covers the online sale of long-lived electronic home appliances. These are, for example, major domestic appliances “white goods” such as washing machines, dishwashers, refrigerators, or washer-dryers. Furthermore, the online sale of small domestic appliances such as coffee machines, espresso machines, food processors, microwaves and vacuum cleaners belong to this market category.